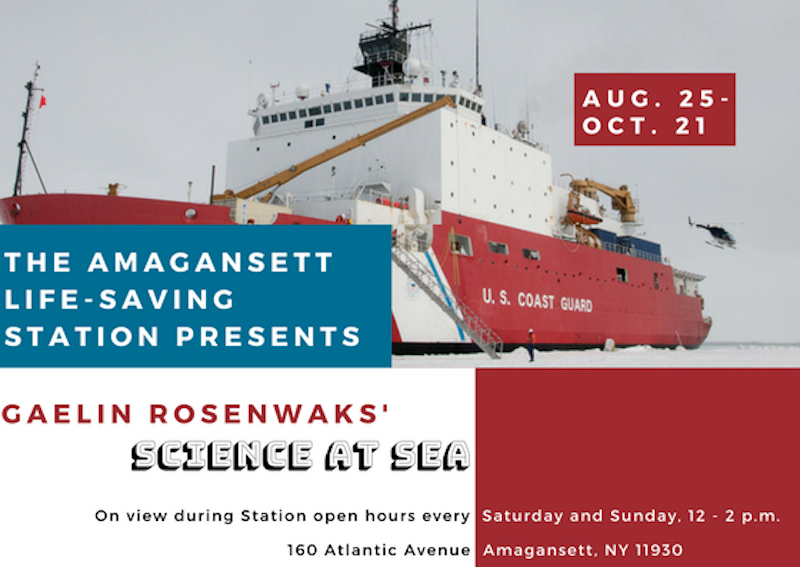 The Amagansett Station is delighted to host “Science at Sea,” an exhibition featuring the photography of marine scientist and explorer Gaelin Rosenwaks. The exhibition will be on view during our open hours every Saturday and Sunday from 12-2 p.m. or by appointment from August 25th through October 21st, 2018. Gaelin Rosenwaks is a marine scientist, explorer, photographer and filmmaker. Alarmed by the changes happening in the oceans, Gaelin, a U.S. Coast Guard Licensed Captain, and a Fellow of both the Royal Geographical Society, the Explorers Club and the Society of Women Geographers, founded Global Ocean Exploration Inc (GOE) to share her passion for ocean exploration, marine conservation and photography. She now participates and conducts expeditions in every ocean to alert the public not only to the challenges facing the oceans, but also to what science is doing to understand these changes.